2015 FEED Congratulates the University of the Philippines’ 85th Year of the Laguna Quezon Land Grant | FEED, Inc.
February 9th, 2015 Report ℅ UPLB, LQLG, Siniloan, Quezon Province, The Philippines. 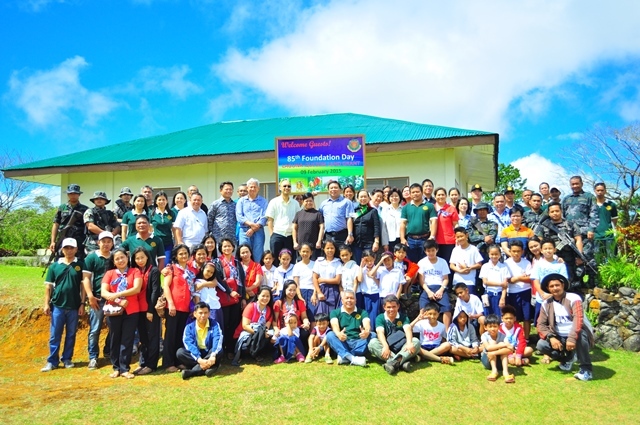 UP officials practically scaled mountains to join the staff in marking the 85th anniversary of the Laguna-Quezon Land Grant (LQLG) on Feb. 9, 2015. UPLB Chancellor Fernando Sanchez, Jr; Dr. Elvira Zamora, Vice President for Development of UP; Dr. Serlie Jamias, Vice Chancellor for Community Affairs; and Dr. Marish Madlangbayan, Vice Chancellor for Planning & Development attended the celebration. Also present were Anne-Marie and Ofelia Mananquil Bakker of Fostering Education and Environment for Development, (FEED) Inc. and Elaine Pagkanlungan, Senior Manager of the Development Bank of the Philippines (DBP). FEED, Inc and DBP are benefactors of the LQLG. The celebration was highlighted by the presence of school children from the Capatalan Elementary School who participated in a poster making event that the LQLG staff organized to introduce forest protection and conservation to the younger generation. The LQLG foundation day celebration also served as a venue for UP and UPLB officials and benefactors to discuss efforts towards forest production and land grant security. At the event, Chancellor Fernando Sanchez also announced the transfer of the Land Grand Management Office from the Office of the Vice Chancellor for Community Affairs to the Office of the Vice Chancellor for Planning and Development. In her closing remark, Zamora reminded the audience to never stop protecting the forests and natural resources. The LQLG is a 14,130 acre land located in the towns of Real, Quezon and Siniloan, Laguna and acquired by virtue of Republic Act 3608 dated Feb 8, 1930. © Copyright. FEED, Inc. 2014-2016. Pingback: Welcome to FEED | FEED Inc.